Donated to the Daly House Museum by Phyllis Ricou in 1985. An embroidered postcard sent from France by First World War soldier, Laurie Smith to his sister. 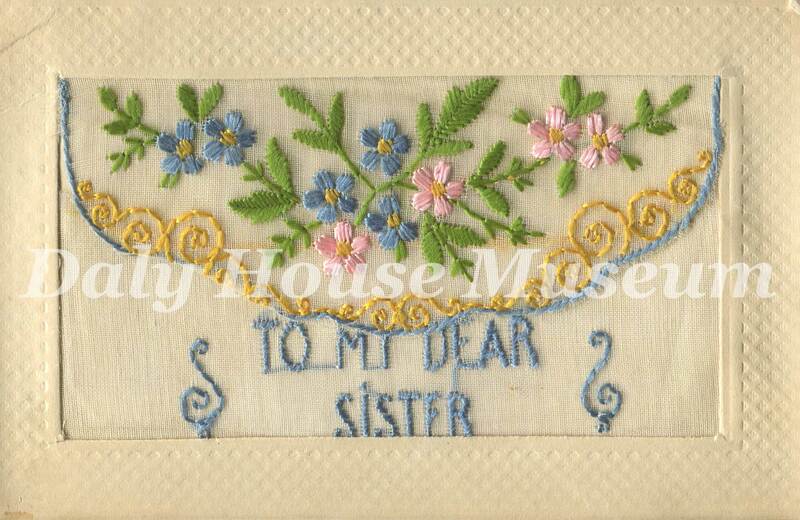 The front of the postcard is fashioned like a envelope and has "To My Dear Sister" is embroidered in blue. There is a small card inside the pocket (numbered separately as 1985.322.18b) with the phrase "Many Happy Returns" on its front. Handwritten note on back: "On active service. France 11/10/17. Dear Bif, just another little card for you. Heaps of love & kisses. Yours, Laurie."